The solution for products with low to medium viscosity with sufficient fluidity to generate a vortex. High shear stress. Production machines with a power range of 22 to 250 kW with infinitely variable speed. It can be built into suspended ceilings or into support steel constructions designed for this purpose. Upon request with rotatable dissolver drive for 2 to 4 tanks. Production machines with a power range of 7.5 to 160 kW with infinitely variable speed. The hydraulic unit to lift the machine’s upper part is built into the pedestal and can also be used for connecting additional equipment such as a tank clamping device. We offer tank covers for the vacuum model and for self-cleaning and self-feeding dissolvers. Production machines with a power range of 15 to 160 kW and hydraulic drive. Mixer for products of highest viscosity and products with highly variable characteristics. 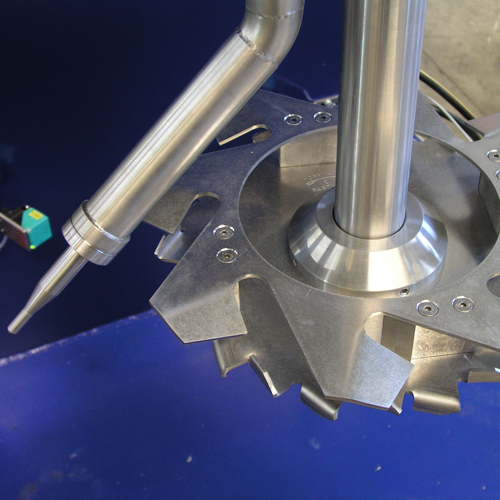 The mixing tool can be chosen from a range of differently shaped tools. During the entire mixing process it oscillates without dead space in the tank. Thanks to the special sealing technology also used in the field of pressmixer technology, the seals’ operational lifetime is exceptionally long. As with the press mixer, the mixer can remain closed for months without having to be cleaned. This machine is an alternative or supplement to dissolvers and bead mills. The system combines the good admixing properties of the powdery filling material of the dissolvers and the excellent frictional power of pearl mills. Viscosities of up to 10,000 cP are possible. Depending on the rotational speed, the drive can be controlled via frequency converters. It is possible to upgrade existing dissolvers with a stator. Automated processes and rising demands on quality and hygiene require the mixers and filling systems to be cleaned efficiently. Individually tailored low and high-pressure cleaning with powerful pump units guarantees reproducible cleaning results. Cleaning fluids require a sophisticated solution tailored to the product – especially in the case of flammable fluids. We are happy to provide such a solution for new plants as well as for existing plants.